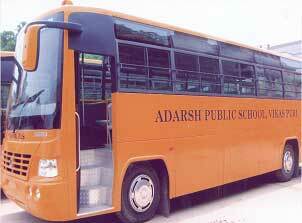 The school provides transport facilities on selected routes. Bus fee is payable in advance for two months along with tuition fee. Discontinuation of conveyance in mid session is not allowed. In unavoidable cases, one month's written notice for withdrawal of bus service must be submitted or one month's fee will be charged in lieu of notice. 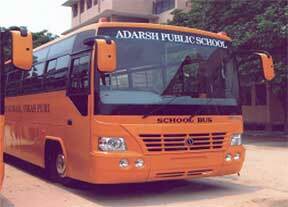 If a child changes residence, change to another school bus is not permitted without permission of the Transport-In-charge/ Principal. All students availing the school bus must ensure that they maintain discipline in & out of the bus or they may be deprived of this facility. Students should not drive motorised vehicles to and from the school. If found doing so disciplinary action will be taken against the defaulters. Mode of transport should be duly intimated to school office and class teacher. Rickshaw pullers/Van drivers are not allowed in the school premises. The bus students will wear Identity Card with red string for identification. The drivers are authorised to stop buses at the designated stop only, unless otherwise directed by the bus teacher. The list of stops is prepared keeping in view the convenience and safety of all bus commuters. Change of bus routes without prior permission is not allowed. When the bus is in motion students must not move around in the bus and no part of their body should be outside the window.